In today’s modern world hunting with a simple bow and arrow can be taken as very primitive and basic. The bow is considered one of the oldest hunting tools known to humanity. 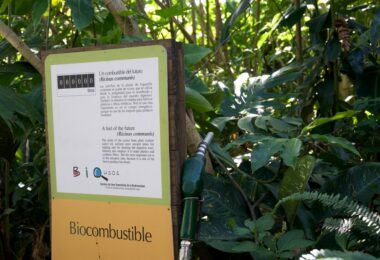 It’s been used for many centuries by our ancestors and in some more primitive tribes on Earth, it’s still used to this day. 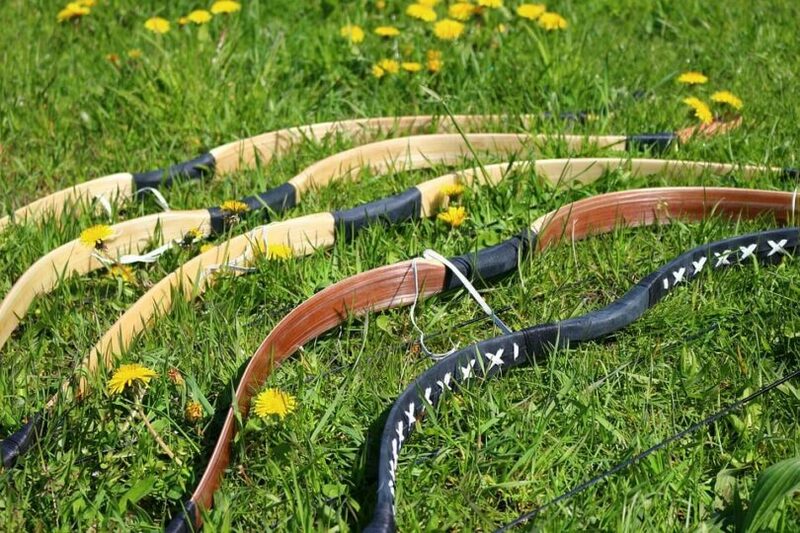 You may want to be better prepared in the wilderness, or just want to show off your skills to your friends, knowing how to make a bow can be invaluable. If most of all you need tools for hunting, in cases you’re lost, or you just look for adventure, knowledge of how to make a bow and arrow can literally save your life. Of course you need to be careful using it, and we will give you advice on that too. 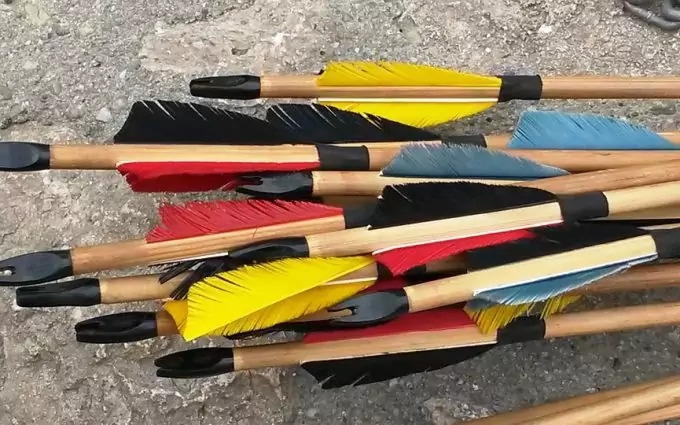 Before you proceed to the actual makings of the bow (and arrow), you need to assess what kind of wood piece you’re going to use. You need to find a branch that is slightly flexible. The best branch would be from oak tree, hickory, teak, black locust. The branch should be a dead and dry one, but not cracking and completely unusable for our purposes. It should be about a man’s height, about 6 feet (1.8 meters). As an alternative you can use bamboo, but it shouldn’t be very thick. Bamboo canes tend to be thick, so if you want to use bamboo, make sure it’s thinner than usual, like a younger stem. They tend to be even more flexible than mature bamboo canes. Your next step is to determine its flexibility and natural curve. To do that, place the wood piece on the ground and press your left hand on the middle of the branch. Meanwhile, pull one end of the branch with your right hand upwards, so you start to curve the branch. Do it carefully and pull lightly. You don’t want to break the branch by pulling it too hard. Even the most flexible wood can break at some point. Next, you have to estimate your handhold on the bow. This may look like an unnecessary step, but it’s actually crucial. If you’re in a heated situation or you need to react quickly you don’t want to look for where to hold your bow in order to make the perfect short – it needs to be obvious immediately. This is why you’ll have to set marks. Determine the midpoint of the branch and measure three inches up and down the branch from that center point. On these two places (above and below the center), set marks (either cut small indentations, or mark with a felt-tip marker, etc). Make sure they are permanent and clearly visible. Another important step in shaping your bow is to determine the harder spots of the wood piece. Place one end on the ground and the other end – hold with your hand at its top. Start curving the branch, hold the bottom end with your leg and keep holding it with your hand as well. Determine which areas seem to be less flexible and shave wood off of them. Cut carefully and in small bits. Do this preferably with a pocket knife. The purpose of this is to have a bow that is evenly flexible. Every now and then, check your progress. You don’t want to overdo this step, since it’s very easy to ruin the entire wood piece. 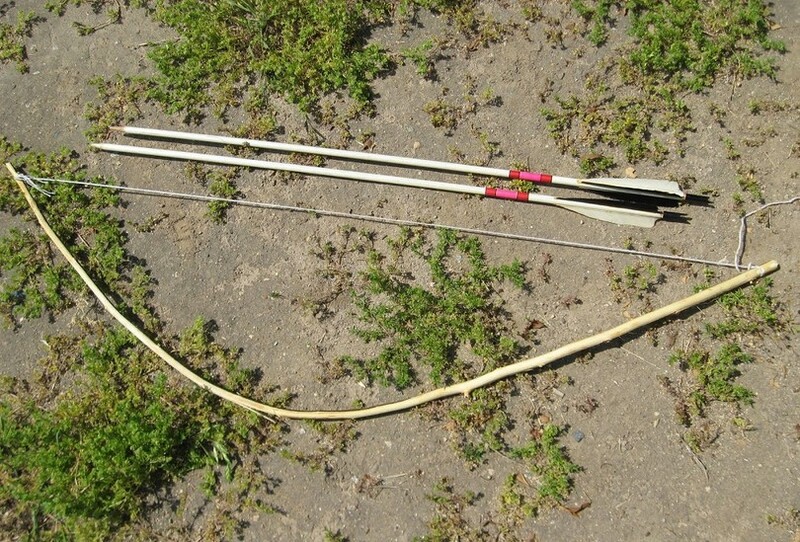 You should end up with a bow that has similar diameter evenly across the branch, and similar curve and flexibility. We still have to point out that you must keep the center area (for your grip) the hardest and keep it as thick as it was originally. Basically, shave wood only on the two ‘limbs’ that are above and below the hand-hold area. Also, note that you should shave wood only on the softer areas of the branch, preferably the ‘belly’ area. When you shave the wood, also keep in mind to remove only bark, not the inner and softer area of the branch. Otherwise, you compromise the bow and it may break easily. Even if you have to shave bark at the handhold area, it should remain the thickest and strongest area, the least flexible. Try to work in symmetry. 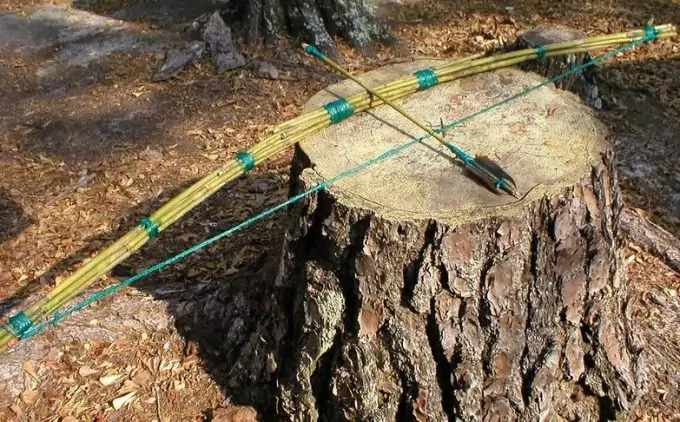 Each limb of the bow should be equally long and flexible; each individual limb should be able to withhold enough amounts of strain and should make a smooth arc when you curve it. Basically what makes the arrow fly is the way the limbs are curving when you put strain on them, by pulling the arrow back on the string. Of course, the limbs should be too thin (with the hope to be flexible) as they may break. Remember, the center of the bow must be thickest and strongest. If you have sandpaper (and we strongly advise you to use one), polish the entire bow. This will remove any hard areas on the surface that can hurt your hands while holding it. Preferably use different grits, and begin with the roughest one and gradually change to grit with finer surface (rough grits have lower number, e.g. 12 grit is very rough, and you can begin with it; 220 grit is a very fine and soft grit; use that for the last polishing touches). The next step will prepare your bow for the string. Cut two notches at each end of the bow. This is where you’ll tie the bow strings. Be careful not to cut the wood too deep for the notches, or you compromise the bow’s strength. As you can see, there’s quite a lot of cutting in this project so we recommend a strong survival knife to get the job done. We can actually recommend some of the best if our review article on the best survival knives. Next you have to choose the bow string. Each bow string has different properties, but overall several options can be equally good. The string must not be elastic. The strength of a bow comes from the elasticity of the wood limbs, not the string. 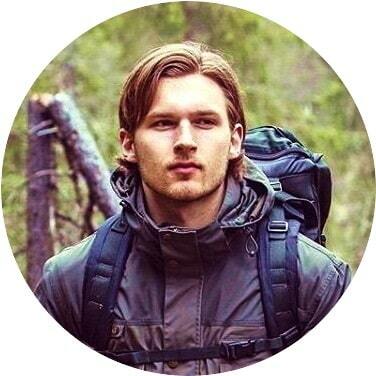 When you’re in the wilderness you may have a hard time finding a suitable substitute for a string, so preparation beforehand is the best option. Otherwise, here are our suggestions: nylon rope, hemp cord, twine, rawhide, finishing line, etc. Remember though that nylon can be heavier and the arrow may not get the strength to fly far. You definitely need a light and strong string. The best on the market is made of polyester (Dacron B-50). Preferably, use several strings and tie them to each other along their length. You’re thickening the final bow string this way, by using not just one string, but several. The final step of preparing the bow is to tie the string around it. So, use the notches to tie around each bow’s end some of the string. Make a knot at each end and then tie loosely part of the string. 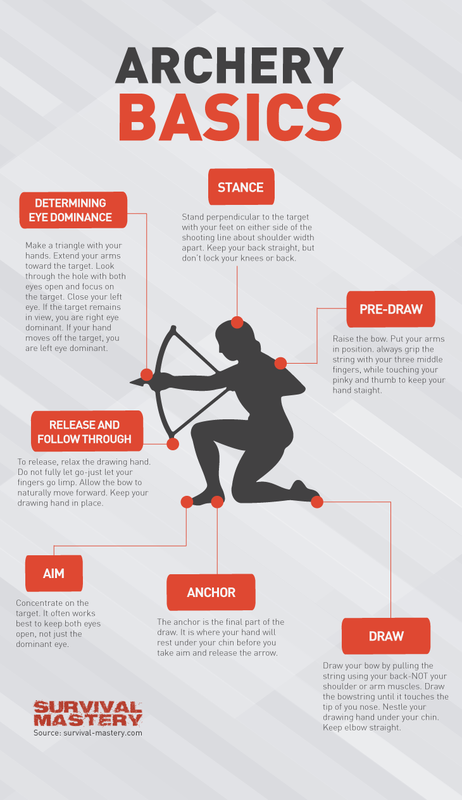 What you’re aiming at is to keep the bow and string taut. This can be achieved by having less of the string’s length untied, compared to the bow’s length. Now test your bow. Stretch it several times. You can place the bow on a branch so you can pull the string downwards to test its strength. Be careful of course, not to pull too hard and break it. 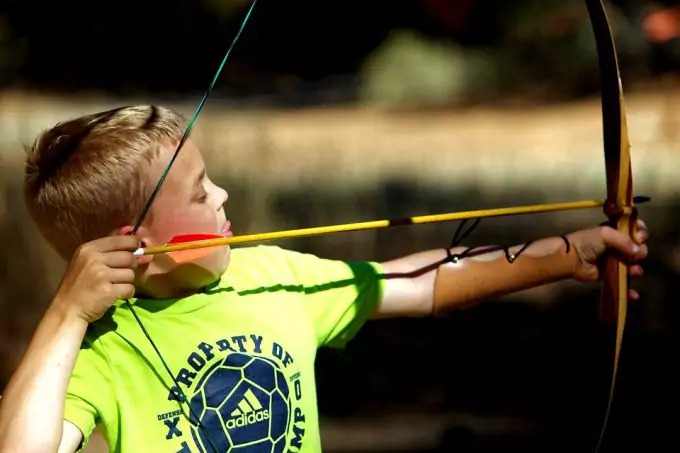 Overall, the bow must be able to withhold the distance from your full-length arm to your jaw (when you’re in archer’s position, ready to shoot). For these steps the requirements for the wood are slightly different. You need to find branches, which are as straight as possible. Any visible curves can potentially change the trajectory of the arrow when shot. The branch should be still alive, and also at least half the length of the bow. You also need to consider the arrow according to the bow’s full potential when stretched. If the arrow is shorter than the distance from your jaw to your stretched arm, then this arrow is unusable. Think what wood to use. We can advise you on green wood, but make sure it’s dried with time. You can also quickly dry it by placing it above fire. The best procedure for drying the arrow though is to leave it to dry inside for several days. This is called ‘seasoning’. After that, it is safe to remove the bark. Mullen and goldenrod are very useful plants for arrows. They are strong and straight and can be found in open areas and fields. Other good options are plum tree, dogwood, and hazel. Even if the arrow is visibly straight, you still may have to straighten it further. Use fire for that. Don’t burn the arrow though. It should be only slightly exposed to strong heat, without damaging the structure of the wood. 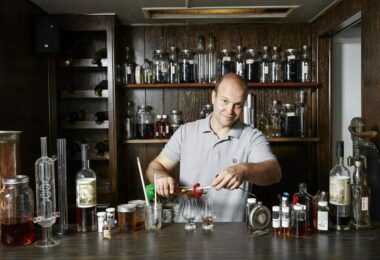 When it cools down, keep it perfectly straight. Preferably put weight on it to flatten out the arrow at its length. You also have to carve the tip of the arrow with a knife. Make a sharp arrow tip. Place it above fire for a short time, so the tip can harden. Again, don’t burn or darken the wood. Also, carve a notch at the very end of the arrow, where it is in contact with the string. This way, when you place the arrow it will comfortably meet the string and will not shift sideways. An optional step is to make an arrowhead. You can use different objects, like stone, glass, bone or metal for the arrowhead. Use stone to chip the object for your arrowhead and make it sharp and pointy. Then with a hammer or sharp stone, make a notch in the arrowhead. Place the arrow (wood piece) in the notch and tie the arrowhead with string or other thread or cord. 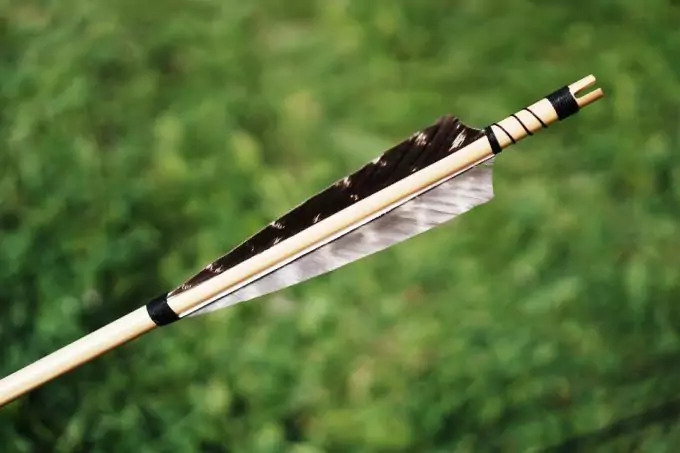 Another optional step, which isn’t going to improve your hunting skills or results, but nonetheless, part of the arrow, is to make fletchings. You can use almost anything light and thin. Usually feathers are the best option. You can carve the back end of the arrow to slide in the fletching’s, or just glue them, and tie around them some cord or fabrics thread. As we said, they are not crucial for your hunting experience, but can improve the accuracy and flight of the arrow through the air. They act like the rudders of small airplanes or ships, by lightly gliding through the air. They may also slightly improve the speed of the arrow, but to a very small extent. Keep in mind though that knowing how to use and perfect the fletching’s takes time and experience. 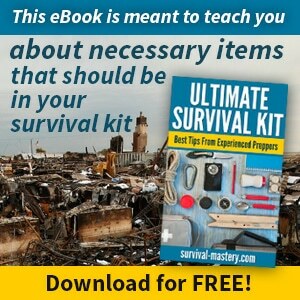 If you need to only survive and hunt, then you don’t need them. Never keep the bow and arrow too close to your face when aiming and shooting. It is very easy to hurt yourself if you’re inexperienced. 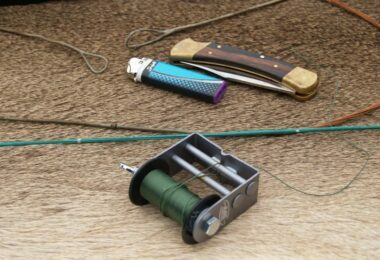 Another useful tip when hunting is to use rope or cord when fishing. This way you won’t lose the fish you shot and will draw it towards you. Also, do not fire unnecessarily and without an arrow (this is called ‘dry fire’). This shortens the bows life over time and can damage it much quicker. It’s very important to learn how to use a bow and you can do this by reading our article on how to shoot a bow and arrow. Keep in mind that the bow has life duration for no more than several months. With time the wood dries out and is more susceptible to breaking. Get used to making a new bow and arrows every 3 to 5 months. This is why it’s good to also get used to carrying a string or cord whenever you go camping or hiking. In case you need to make a bow urgently you will have the cord. This is the only piece of the bow that is hard to make from scratch in the wilderness. Also, be aware that hunting with bow and arrow is very difficult and it takes time and practice to get used to the tools and handle them properly. Too much wood carving at a particular spot. This can easily compromise the bow’s strength and durability, and can turn to the weak spot, which causes the bow to break. Natural imperfections and flaws on the wood. This isn’t something you’re responsible about, but must be aware of it when you choose and layout the bow at the first stages. Bad preparation of the bow, like sanding, polishing, etc. If you don’t burnish your bow, it may last much less. Burnishing gives the bow additional strength and protection. Tying the strings. This stage can ruin your work so far, if you don’t do it properly. In order to fix some of the above issues, you will have to go through the above stages many times until perfecting your bow. You may have to tiller many times, until you’re certain the bows limbs are bending and flexing evenly and consistently. This is crucial if you want to prolong your bows lifespan. Another tip for your bow’s health is to unstring it when you’re not using it. This relieves the strain on the wood and gives it time to settle back to its initial form. The longer the bow stays with the string the most it bends naturally to that position, and the less shooting power it has as a result. Remember that the arrow will fly faster if the wood puts stronger pressure on the string. Also, don’t give your bow to inexperienced people. There are very easy ways to damage a bow by just not knowing how to handle one. If you don’t want yours ruined, keep it to yourself. Of course, if you make a bow, but then don’t use it at all, better give it to someone else who may enjoy using it, instead of keeping it in the closed and letting it gather dust. A word of caution: don’t use the bow on humans, pets, etc. If it’s for hunting in the forest (and you’re legally allowed according to laws and seasons), then by all means, use it. Otherwise, it can be and is a lethal weapon and shouldn’t be taken lightly. Don’t give it to children who don’t know how to handle it. They may hurt someone else, and especially themselves. So, take care of your bow and arrows, use with care and only in extreme cases (in a survival situation), and practice a lot in order to become better and better with time.